Three different dot sizes (7 pl minimum) and the maximum resolution (1,080x1,200 dpi) ensures beautiful print results without a grainy appearance. World proven Mimaki technology creates unbeatable high denition and resolution print. 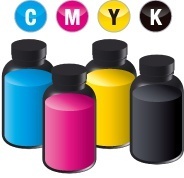 CS100 ink, available in 2-liter bottles, is not only more affordable than conventional ink cartridges, but the ink has exceptional stability and low propensity to clog nozzles. 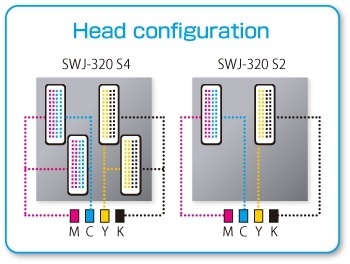 The CS100 inks also bring the same high Mimaki standards for color accuracy, image durability and weatherability found in conventional Mimaki solvent inks. The printhead is maintained in good condition by proven nozzle maintenance capabilities including pressure purging*1, automatic suction*2 and automatic wiping*3. *1. A pressure is applied to ink and the ink is jetted from the printhead. *2. When the printhead is on a cap, ink that remains on the head nozzle surface is suctioned. *3. Nozzle surface is automatically wiped. Promotion Movie "SWJ-320 Series" has been launched!